Traveling essentials for most are a phone charger, money and perhaps a refillable water bottle. What about a mini first-aid kit? Meadow Carman always has one in her backpack. It’s because her mother, Emily Carman, is a first-aid instructor and insists she carry a first-aid kit with her. The kit proved to be a lifesaver over the Christmas break, as the Pursuit of Excellence (POE) student athlete was traveling home to Barton, Nova Scotia via Toronto. Late for a connecting flight, Carman, 18, was running with a gentleman who wasn’t sure where he was going. As they sprinted to catch their flight, she noticed the man was having a hard time breathing. He eventually dropped to the floor. It was an incredible feeling for Carman, who was thankful the gentleman was okay. Carman, the Canadian Sport School Hockey League’s (CSSHL) Female Humanitarian of the Year Award winner, doesn’t wish that scenario on anyone. However, she is happy she was prepared for it. She felt shock well after and said the experience has given her a greater appreciation for life. “You never know what could happen. It’s crucial to live life to the fullest,” she said. “Be thankful for every moment that you have. 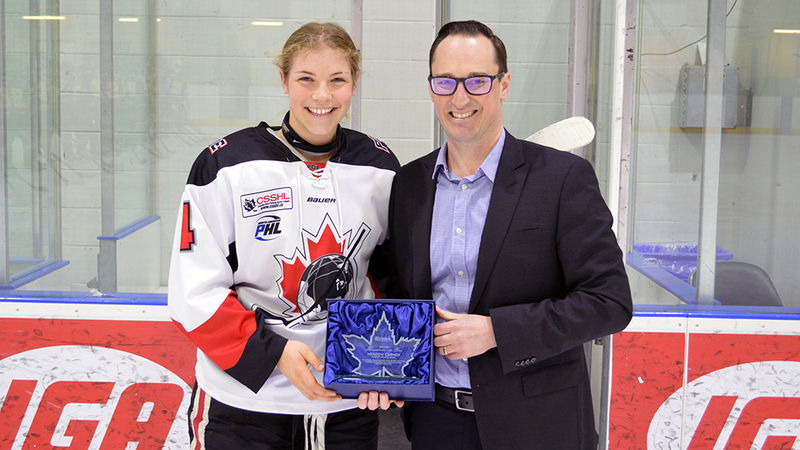 After winning the Humanitarian Award, Carman did her part to help POE win a second consecutive CSSHL Female Prep championship. Not only will Carman jump in and perform life-saving procedures, she will team up with people to build homes. She spent a week in San Quentin, Mexico with POE making friends and helping families. They worked alongside families to help changes lives. Carman was blown away by generosity from the family they were building a home for as the family purchased what they could from a convenience store to give to Carman’s group. Carman’s group also made a positive impact by giving kids colouring books and doing activities, such as playing soccer. One fun night turned tragic when a man collapsed and died of a heart attack while playing. The next morning, Carman led a gathering in which she felt the need to speak. Her Christian faith took over while speaking to the people. Carman, who will study medicine at Brown University, has been influenced by her parents and brothers, Logan and Thian. Her parents are outgoing and want to make positive impacts in their community. To close a gap in what she felt was segregation between POE and George Elliot students in Lake Country near Kelowna, she encouraged her teammates to join the Coyotes basketball team. She wanted to play a part in creating a new culture at school. Her assistant coach, Jessica Campbell, said Carman is a remarkable individual.